It’s December! That means the residents of Dyker Heights are setting up their famous, dazzling holiday displays from 83rd to 86th Streets between 11th to 13th Avenues. There’s even a guided bus tour complete with Christmas music and fun facts about the neighborhood. Learn more at the Dyker Heights Christmas Lights Facebook page. 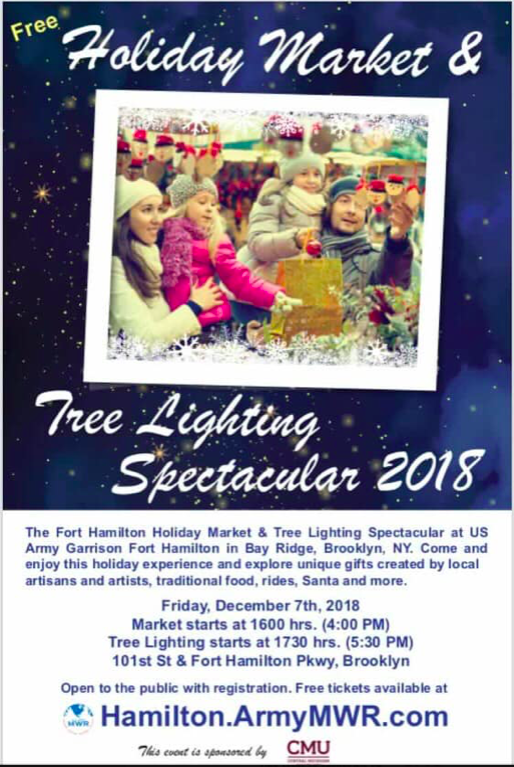 Check out our list below of other upcoming fun holiday events. The largest menorah in Brooklyn will be lit every night of Hanukkah! 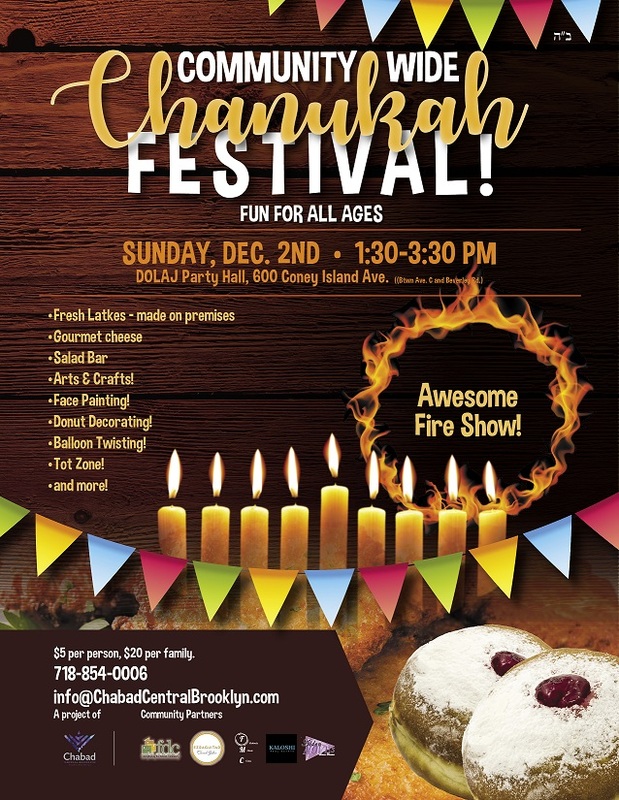 Each evening will feature live music, latkes, and gifts for children. Celebrate the festival of lights and enjoy fresh Latkes – made on premises, delicious salad bar, and gourmet cheese! Activities for children include Donut decorating, Face painting, Balloon twisting and much more! 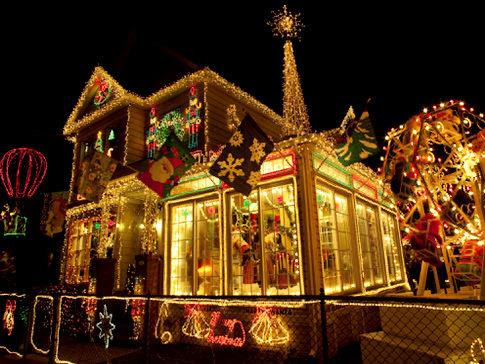 Lifelong Canarsie resident Frank Seddio oversees this annual event that features more than 50,000 lights, nearly 100 animated dolls, and a talking Christmas tree across eight festive displays! The DUMBO Improvement District invites all to the 13th Annual DUMBO Holiday Tree Lighting Ceremony for carols, calypso, cocoa, and more! The event organizers will also host the Big Brooklyn Holiday Toy Drive. They’ll collect unwrapped toys for children up to 14-years-old. Shop for holiday gifts by local makers, meet Santa, and more! Registration and photo ID required. This annual holiday tree lighting event includes a visit from Santa. 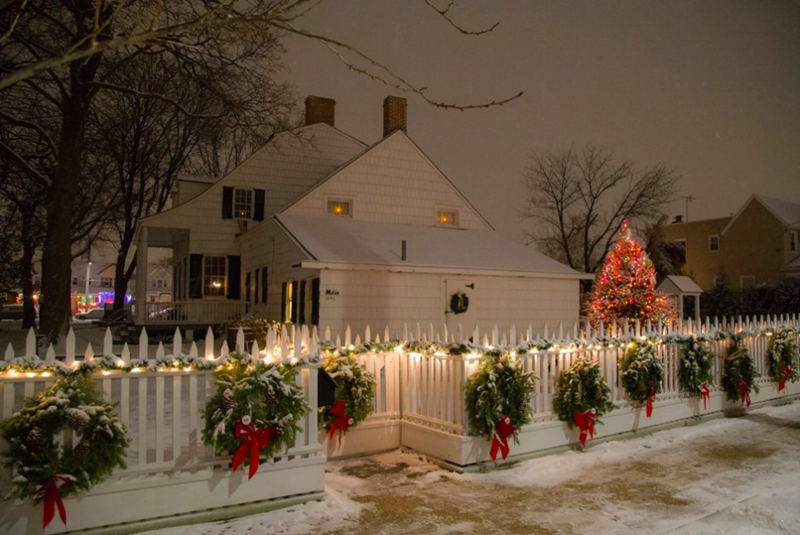 Join Court Street Merchants Association, Friends of Carroll Park, elected officials, neighbors, and maybe even Santa at this holiday tree lighting event at the Louis Valentino, Jr. Ballfield. A party will follow at the Robert Acito Park House. The event organizers will also host a holiday food drive for City Harvest. They’ll collect non-perishable canned or boxed items. This annual event features music, hot cocoa, cookies, and a visit from Sinterklaas—Dutch for Saint Nicholas, the patron saint of children. Gather with neighbors for free hot cocoa, cookies, and selfies with Santa at this annual tree lighting in Fort Greene Park. There will also be a toy drive collection. 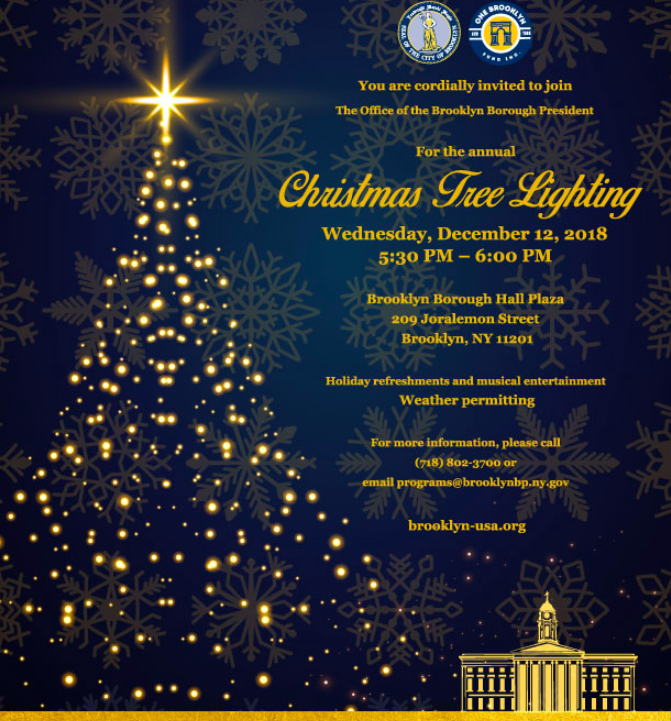 Join Brooklyn Borough President Eric Adams at this annual event where there will also be holiday refreshments and musical performances (weather permitting). While the holiday lights were already switched on earlier this week, be sure to check out the illuminated decor on Mermaid Avenue. Thousands of LED lights and a “Welcome to Mermaid Avenue” sign will welcome shoppers and visitors throughout the holiday season. Santa Claus will be cruising along 5th Avenue in Park Slope in a burgundy 1966 Dodge Dart convertible from 2pm to 5pm on Saturday, December 1. Two groups of costumed Carolers from Opera on Tap will also perform for shoppers and passersby on 5th Ave. If you miss Santa and the gang tomorrow, they’ll be back the following two Saturdays. On December 8, from 10am to 12:30pm, they’ll be at The Old Stone House. On December 15, catch them at Du Jour Bakery (365 5th Ave) from 3pm to 4pm and Pure Bistro (88 5th Ave) from 4:30pm to 5:30pm. 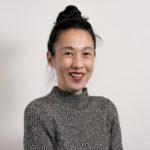 While the Sunset Park Fifth Avenue Business Improvement District lit up its Christmas tree last week outside of Our Lady of Perpetual Help on the corner of Fifth Avenue and 60th Street, they will offer free rides in an old-timey trolley making all B63 stops along 5th Avenue from 38th to 64th Street. Drop off your gifts at this wrapping station and a member of the Brooklyn Adult and Teen Challenge team will wrap it up and make it festive. The cost ($5, $10, $15 per gift depending on size) goes towards supporting Brooklyn Adult & Teen Challenge. Also, in celebration of Hanukkah, Katz’s at Dekalb Market Hall will give away 800 latkes! The first 100 people in line during each of the eight nights of Hanukkah (December 2 through 10 starting at 6pm) will receive a latke.